Clank. How long will it take Charles Barkley to crack his first joke about Shaquille O'Neal's career-long ineptitude at the foul line? Shaq on Thursday inked a multi-year deal with TNT, where his principal forum will be the NBA studio show already populated by Barkley, Kenny Smith and host Ernie Johnson. "I felt this was the place for me. You guys are very fun," O'Neal said in remarks distributed by the network. ESPN's studio show just got even duller by comparison. But with the NBA lockout in progress, both TNT and ESPN may have too much time on their hands before the season resumes. Most analysts are envisioning a lengthy impasse, although O'Neal's opinion on the matter is not included in the 18 different topics addressed in TNT's publicity release. "I have the ability and backing to give fair criticism," O'Neal says. "The only time I have a problem with people giving criticism is when they haven't walked that walk." He also threw out a few thoughts on the Miami Heat's loss to the Dallas Mavericks in the NBA Finals. "Dirk (Nowitzki) played unbelievable," he said. "They (the Mavericks) played together. I just think it was their turn. Michael Jordan told me a long time ago that before you succeed you must first learn to fail. This was the Big Three's first time together and they made it very far and they are going to be together for a long time. I'm guaranteeing they will be back." 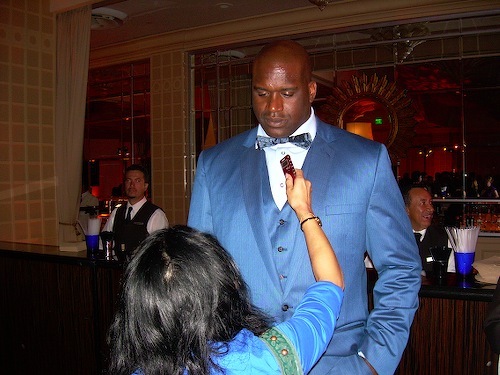 You're going to have to do better than that, Shaq. But there should be plenty of time to practice.